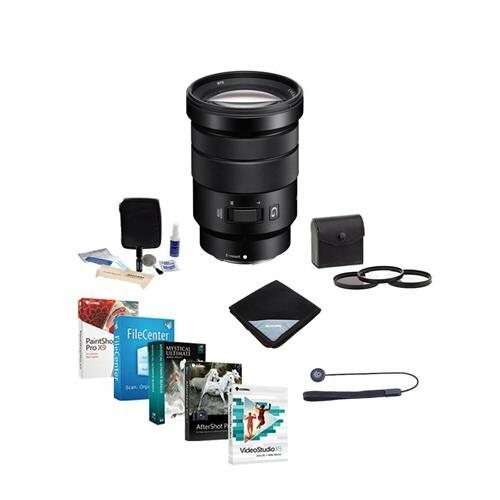 Purchase Sony 18-105mm F4.0 G OSS E-Mount NEX Camera Lens Bundle with 72mm Filters & Pro Software at Discounted Prices ✓ FREE DELIVERY possible on eligible purchases. Adorama Camera Lens Valuable Bundle. Kit Includes. Sony 18-105mm F4.0 G OSS E-Mount NEX Camera Lens, Front and Rear Lens Caps, ALC-SH109 Petal-Shaped Lens Hood, Lens Case, Sony 1 Year USA Warranty. 72mm Digital Essentials Filter Kit with Ultra Violet, Circular Polarizer and Neutral Density 2 Filters + Pouch. Lens Wrap, 19x19", Black. Digital Organization Creativity Software Kit, Includes PaintShop Pro X7, AfterShot Pro 2, Nuance OmniPage 18, FileCenter Standard 7. Universal Lens Cap Tether.